In Don McLean's 1972 classic rocker American Pie, he laments "the day the music died" - referring, of course, to the tragic Iowa plane crash in February of 1959 that killed Buddy Holly, Richie Valens and "The Big Bopper." 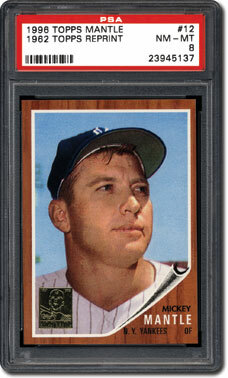 For many baseball fans of my generation, August 13, 1995, was "the day baseball died." 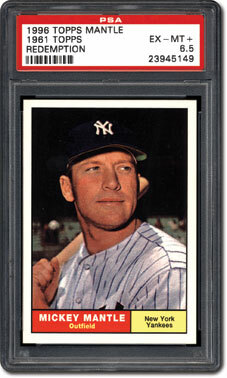 I'm referring to the day Mickey Mantle passed away at the young age of 63 in Dallas, Texas, from cancer. We could see it coming, but his death was still a shock: The all-American boy from Oklahoma who hit those tape measure home runs in the 1950s and 1960s was gone. My first allegiance to a baseball team was to the New York Yankees of the early 1960s, teams that went to five straight World Series from 1960 to 1964 and won two of them in 1961 and 1962. I just assumed that "the Bronx Bombers" would be there every year: What 7-year-old Yankees fan wouldn't? 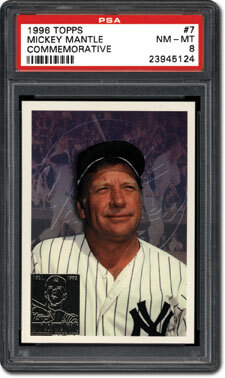 And of course, when we flipped baseball cards against the brick wall of Mt. 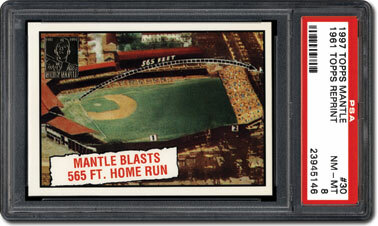 Pleasant Elementary School during recess, the prize was Mantle's #350, 1960 Topps card or his #300, 1961 Topps card. 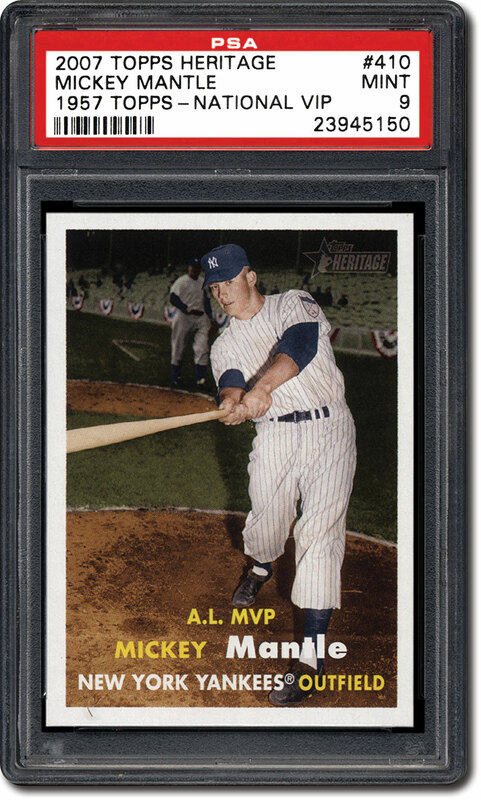 Sure, it was nice to pull a Hank Aaron or Willie Mays from a pack, but Mantle cards were like gold nuggets to us back then. Even the Nu-Card Scoops newspaper clipping cards from 1960 and 1961 that featured Mantle were valued more than other Topps cards. 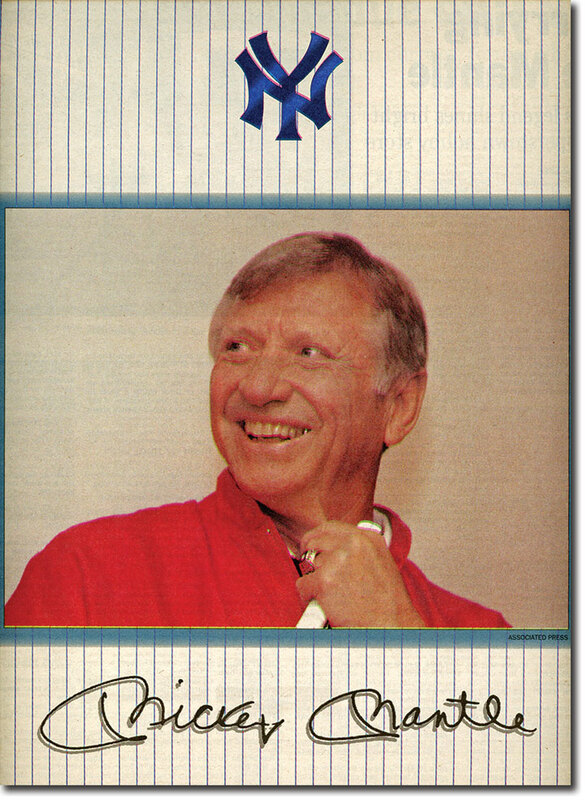 At home, I was confronted with the task of choking down a bowl of Post Grape-Nuts so I could cut the Mantle card off the cereal box. (I was a confirmed Alpha-Bits addict, which explains why I wound up with so many Hector Lopez cards.) 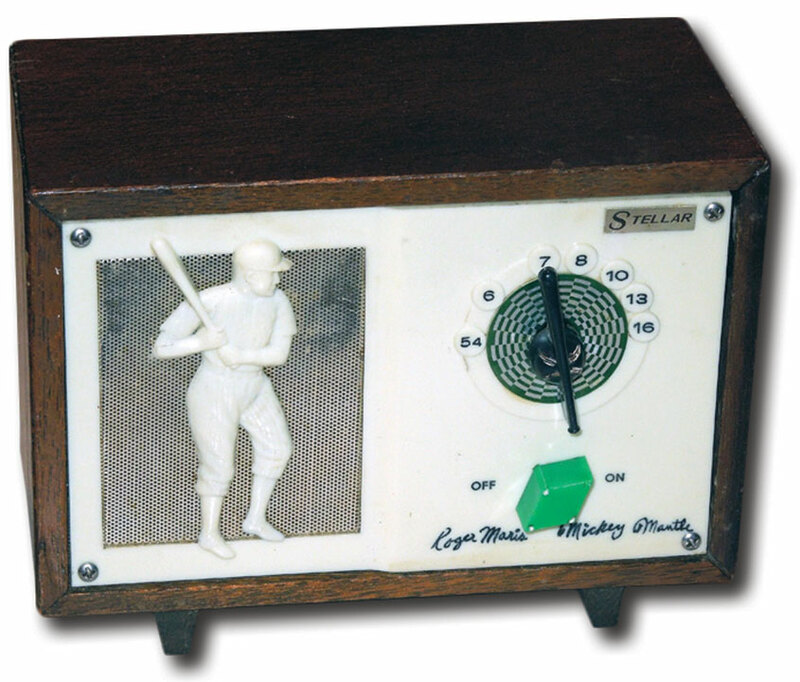 I listened to Yankee day and night games through the hard plastic headphones of my Heathkit crystal radio receiver and read the box scores in the paper, looking to see if Mickey had hit any home runs that day. I wasn't alone. 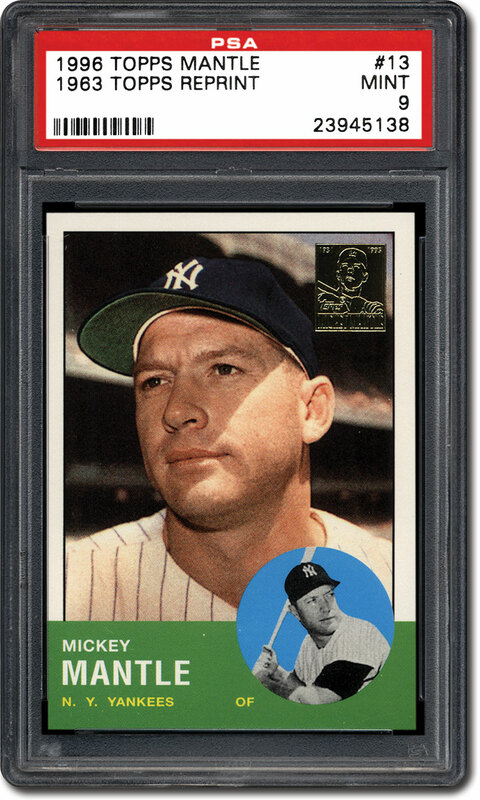 Mantle was one of those charismatic ballplayers who came along at precisely the right time, just as television and baseball were getting comfortable with each other. His good looks, wacky sense of humor and amazing displays of strength and speed caught the imagination of millions of Americans. Even today, it can be argued that Mickey Mantle was the most recognizable and popular athlete of the 1950s and 1960s. The value of his collectibles certainly bears that out. In past SMR articles that highlight the 50th anniversary of Topps baseball sets, Mantle's card is, more often than not, the most valuable in each set. 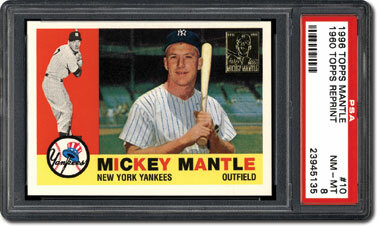 We recently covered the numerous items that make up a Mantle Master Set, and in recent months, his 1950s-era cards have been skyrocketing in value. 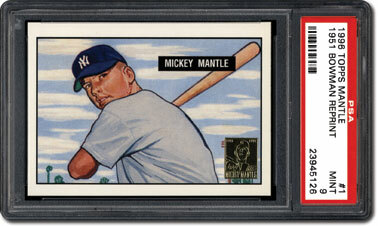 Only Babe Ruth memorabilia equals Mantle in terms of popularity. Forty-six years after Mantle retired at age 37, he still owns numerous baseball records. 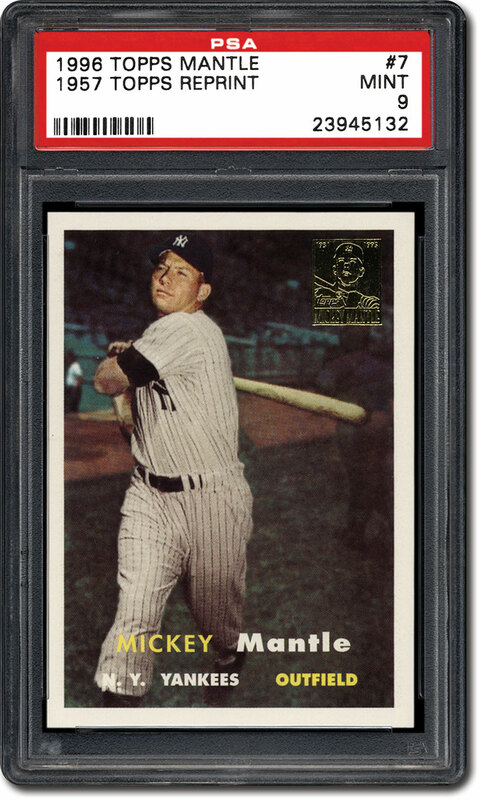 Mickey won seven World Series rings in twelve tries and captured the Triple Crown in 1956 - the only switch-hitter to do so. He was also the American League's Most Valuable Player in 1956, 1957 and 1962. Mantle still has more World Series home runs (18) than any other player to go along with the most Series runs batted in (40) and total bases (123).Â He's also one of only three Triple Crown winners to earn a Gold Glove! 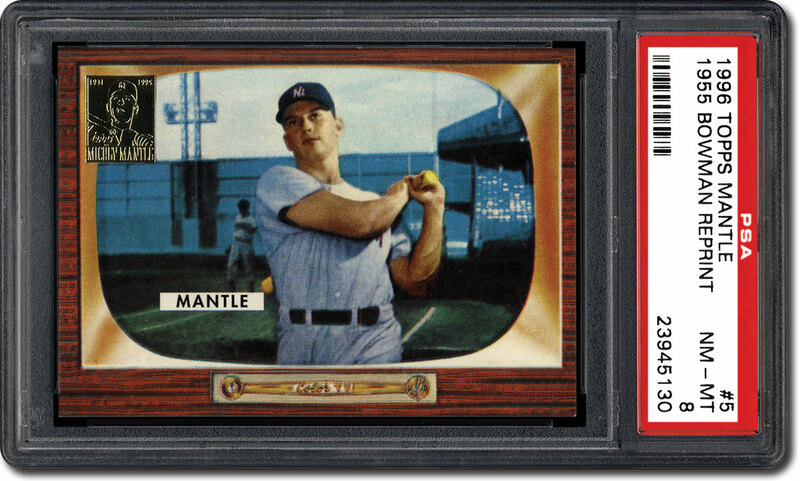 Mantle's prodigious slugging (536 home runs in 18 seasons, many of them injury-ridden) led to the expression "tape measure home run." In 1953, he smacked a ball at least 565 feet out of Washington's Griffith Stadium, and in 1963, he hit one off the upper facade at Yankee Stadium, 370 feet away and 118 feet above the playing field. 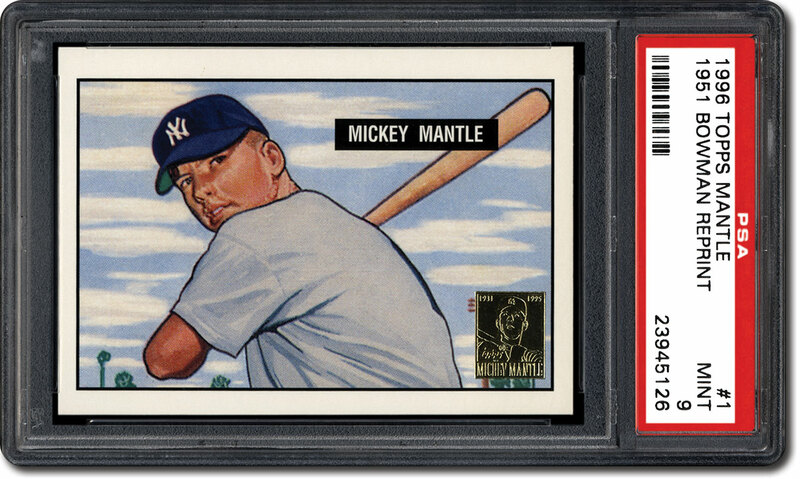 As a rookie in 1951 spring training, he smacked two balls out of the University of Southern California's Bovard Field, and one of them was calculated to have traveled over 600 feet before it came to rest. No wonder fans young and old stood up and paid attention every time Mantle stepped into the batter's box. No lead was safe when he was at the plate, and Mantle had a knack for late-game heroics with timely hits, doubles and even a four-bagger at the most opportune time. Even later in his career when he largely played first base for an underachieving, second division Yankees team, Mickey could still bring the crowd to its feet. 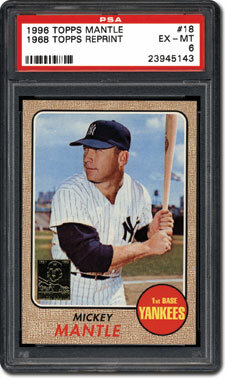 Mantle enjoyed partying when he was an active player, and as a result, increasingly battled alcoholism after his retirement. Having lost his father to Hodgkin's disease at the relatively young age of 40, Mantle adopted a fatalist mentality and decided to enjoy life to the fullest - and then some. He had four sons with wife Merlyn (Johnson) Mantle, but like Mickey, three of them became alcoholics and two of them (Billy and Mickey Jr.) later died at young ages. In the early 1980s, Mantle and old Giants foe Willie Mays worked at Atlantic City's Claridge Hotel and Casino in a goodwill position: greeting and dining with high-rollers, playing in golf tournaments and participating in other community outreach events. However, baseball commissioner Bowie Kuhn strongly disapproved of Mantle and Mays working so closely with a gambling establishment, even though gaming was legal in New Jersey. Accordingly, he placed both players on a "permanently ineligible" list, banning them from anything to do with Major League Baseball. It was a monumentally stupid decision and action, given the popularity of both players and the innocuous positions they held at the casino. 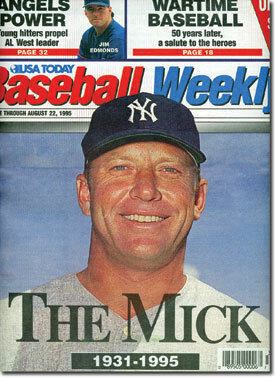 Kuhn caught plenty of flack for it in the press, especially in New York City: This was "The Mick" and Willie! How could you cut them off from the game they so thoroughly dominated for years? 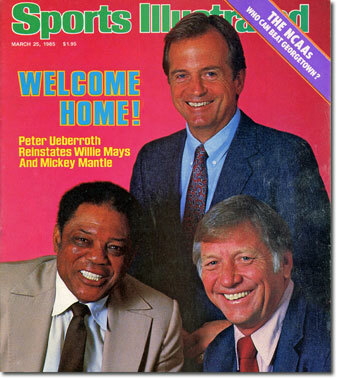 Fortunately, the next commissioner of baseball - Peter Ueberroth, fresh off his triumphant organization and staging of the 1984 Los Angeles Olympic Games - repealed the suspensions in March of 1985, much to his credit. And Mickey and Willie were welcomed back with open arms by generations of baseball fans. 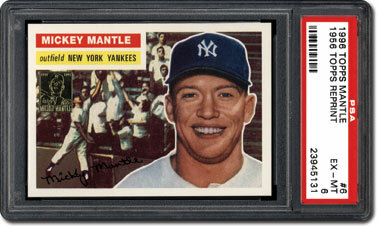 Mantle was also much in demand on the show circuit. At one point in the mid-1980s, promoters were asking and getting $30 to $40 for his autograph - an astounding price at the time when a typical major league autograph went for between $3 and $5. 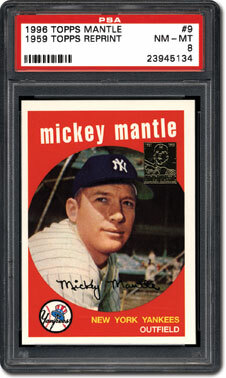 Mantle got so many requests for his signature that he announced a limit of 700 items per session, partially because he wanted his signature to look consistent on each item. 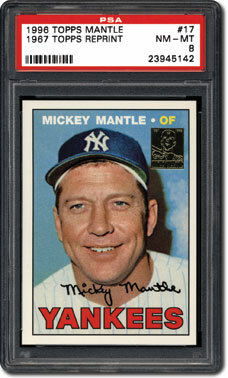 I remember going to a sports collectibles show at the Hyatt Regency hotel in New Brunswick, New Jersey, in March of 1985 where Mantle was the featured autograph guest. 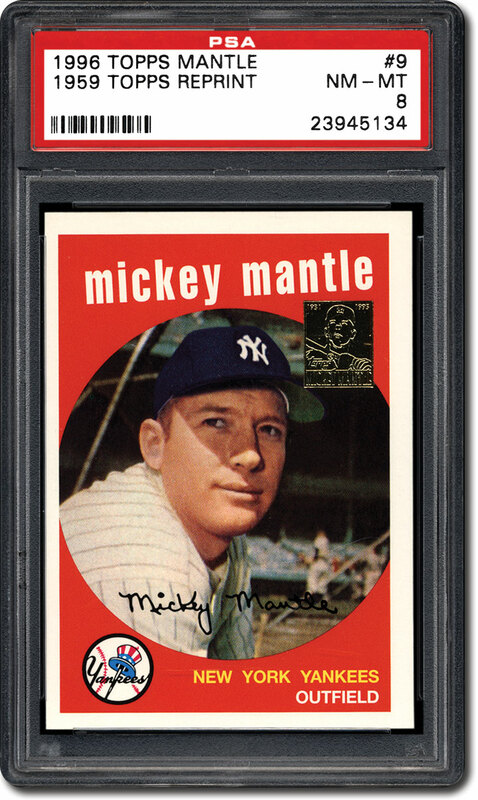 Over 1,200 autograph tickets were sold, and Mantle sat at a table quietly signing bats, photos, gloves and other memorabilia while two would-be bouncers flanked him, ready to chase off any overeager fans who wanted to strike up a conversation. Coincidentally, 1985 was also the year of the legendary 1952 Topps "Find" in Boston of unopened Topps cello packs, loaded with high number cards. 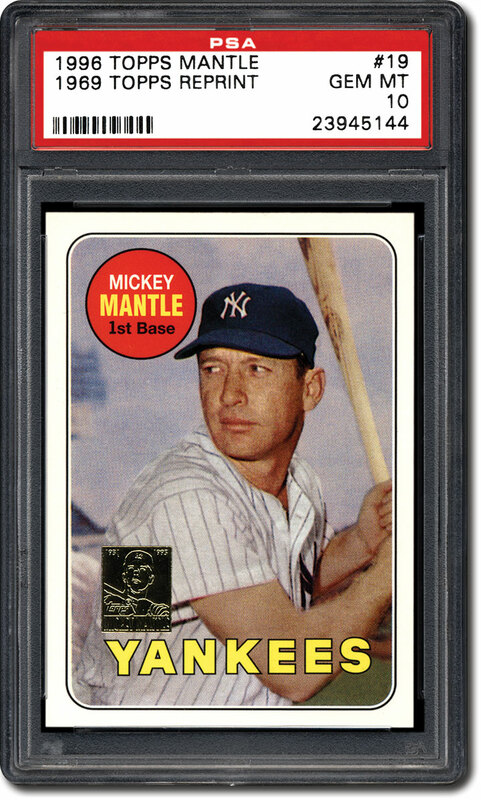 There were plenty of Mantle rookies in that case lot; in fact, there were so many that prices for the nicer cards actually dipped as the market was briefly flooded. 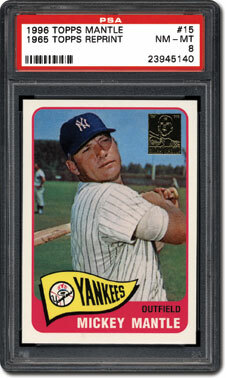 I remember picking up what would have probably graded today as a near PSA NM 7 example for all of $2,500 that summer. And many of the PSA NM-MT 8 examples in the hobby today came out of that find. 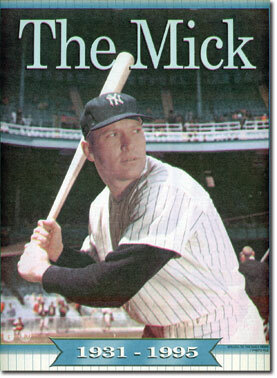 Later that year, Mickey was profoundly affected by the death of his friend and former teammate Roger Maris at age 51. (Ironically, Maris had been diagnosed with Hodgkin's lymphoma two years earlier.) 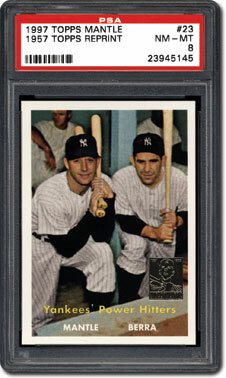 In a National Public Radio interview with long-time sportscaster Bill Weaver in 1998, he stated that Mantle and Maris were the best of friends, even throughout the 1961 home run chase. 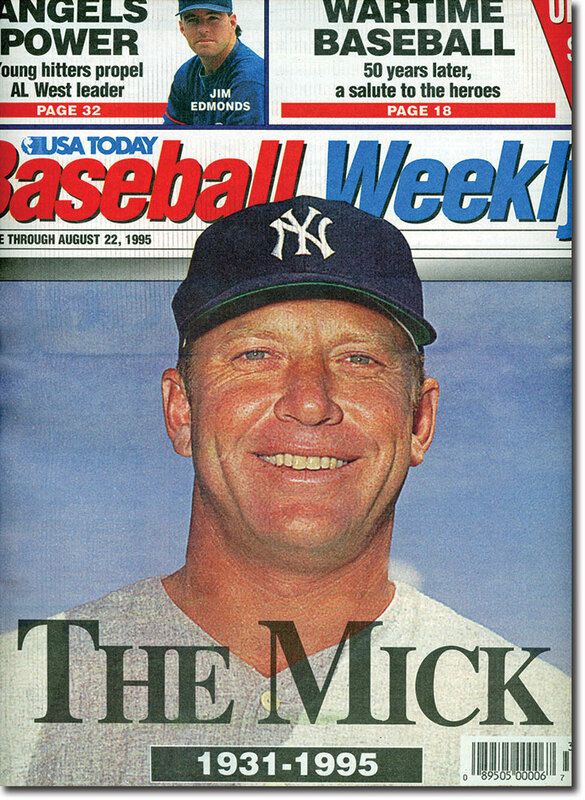 According to Weaver, "Mickey would be reading the paper and he'd say 'Hey Roger. You and I are fighting again!'" 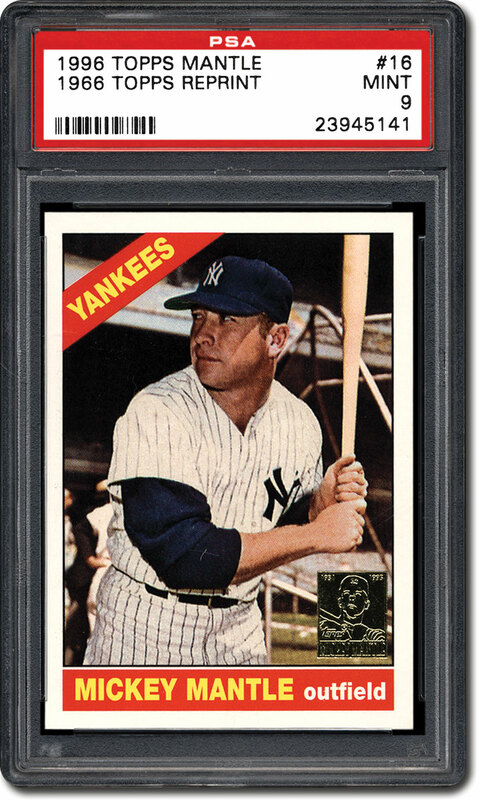 Mantle was a pallbearer at Maris' funeral and in Weaver's words, "sat in the pew across from me and cried his eyes out for an hour." Through the rest of the 1980s and the early 1990s, Mantle continued his partying. 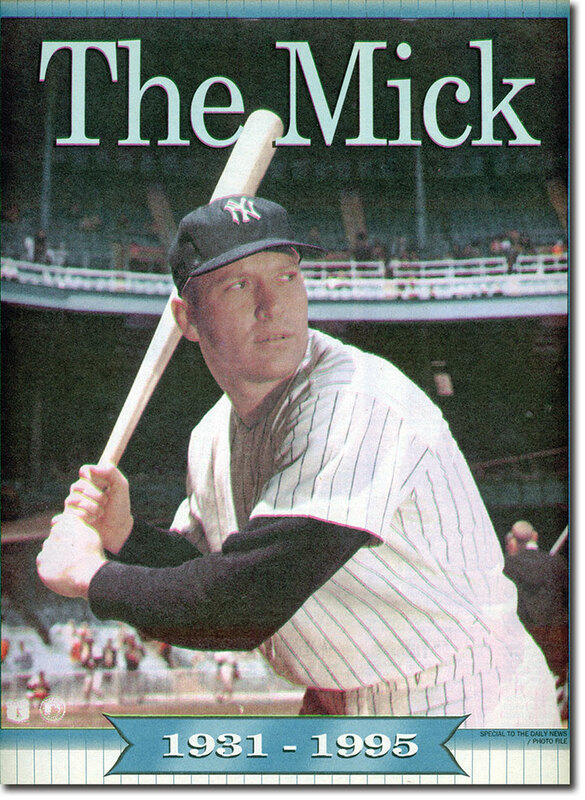 At one point, he became a partner in a since-closed restaurant on Central Park South in New York City that carried his name, and the place became legendary: New York radio personality Don Imus used to invite listeners to "visit Mickey Mantle's restaurant and see if you can find the table he's under." Mantle himself used to tell a joke in which he shows up at the gates of Heaven, only to be turned away by St. Peter for his destructive lifestyle. "But before you go, Mickey, can you sign two dozen balls for God?" Everything came to a head nine years later when Mantle checked into the Betty Ford Clinic to seek treatment for his alcoholism, following the lead of his estranged wife Merlyn, his sons and the advice of old pal Pat Summerall. 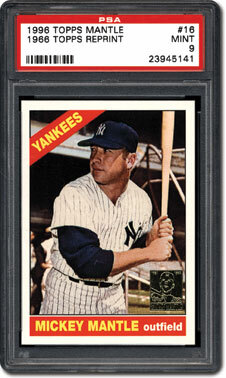 Mantle was promptly told by a doctor that his liver was basically gone and that "your next drink could be your last." Two months later, his son Billy passed away at age 36 from a heart attack, partially attributed to his own battles with Hodgkin's lymphoma. 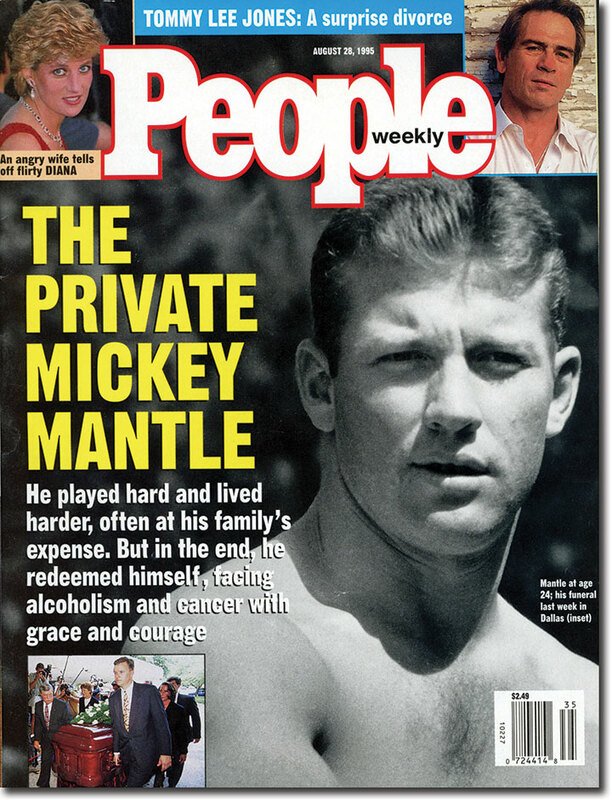 In a 1994 Sports Illustrated story following his rehab, Mantle stated that it had finally dawned on him that many of his funniest stories involved him and/or other teammates being drunk, and that he needed to make a major change in his lifestyle and get close to his family again. Inspired by former Yankees second baseman Bobby Richardson - an ordained minister - Mantle became a born-again Christian. But the end was near. After being rushed to a hospital in Dallas for severe abdominal pains, Mantle finally received a controversial liver transplant in June of 1995 after doctors detected a carcinoma in his original liver. 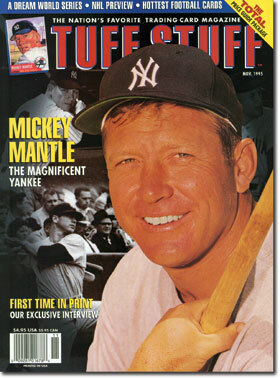 At a post-op press conference in July, Mantle made his now famous plea to youngsters: "This is a role model. Don't be like me!" The press was full of comments and speculation about the speed at which doctors had been able to find a matching liver for Mantle, allegedly bypassing others who had been on transplant lists for months or longer. But his physicians stated the decision was solely a medical one, given Mantle's rapidly-deteriorating condition. Barely a month later, Mickey was gone. 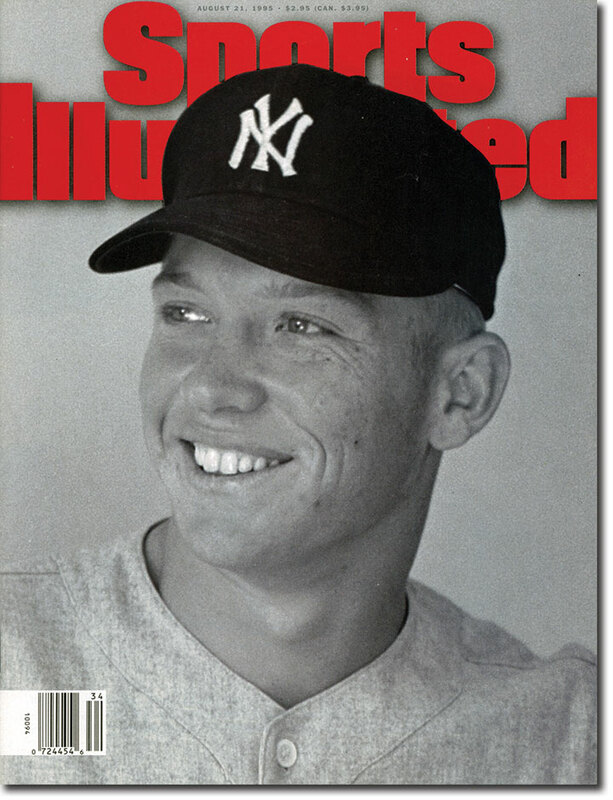 Yankee players wore black for the rest of the season, and Sports Illustrated's cover for their August 21st issue consisted of a black-and-white photo of a smiling, much younger Mantle - and nothing more. 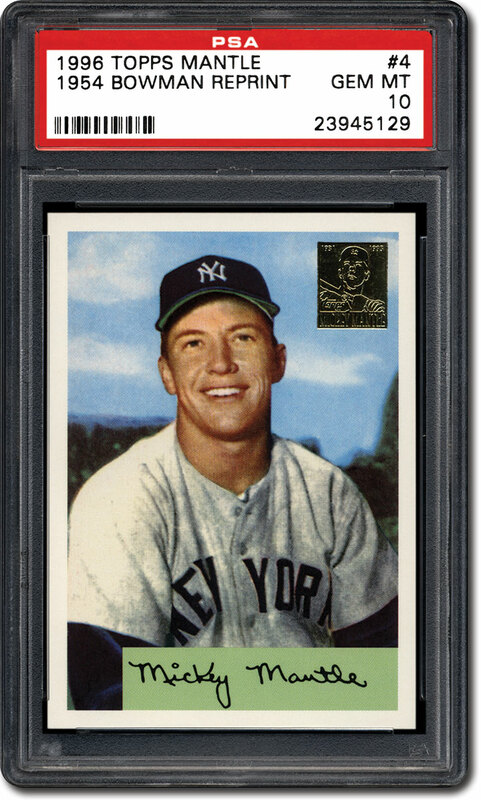 In his eulogy, sportscaster Bob Costas stated, "In the last year of his life, Mickey Mantle, always so hard on himself, finally came to accept and appreciate the distinction between a role model and a hero. The first, he often was not. The second, he always will be." 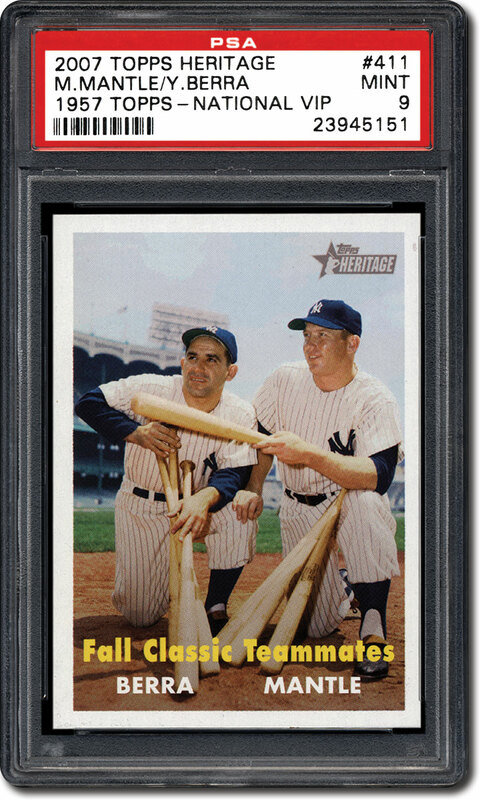 On August 25, 1996, Mantle's Monument Park plaque at Yankee Stadium was replaced with a new monument, bearing the words "A great teammate" and keeping the phrase "a magnificent Yankee who left a legacy of unequaled courage" from his original plaque. 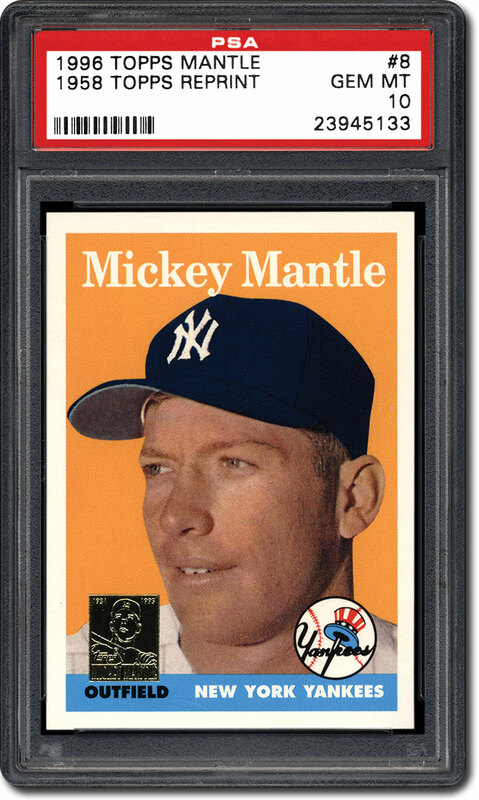 Topps also retired #7 from its 1996 baseball set (Mantle was featured in that slot in 1996 and the #7 card was removed for subsequent years until 2006, when it was reserved for special Mantle cards). Topps also issued an 18-card reprint set of his 1952 through 1969 Topps regular issue cards, plus his 1951, 1954 and 1955 Bowman cards. 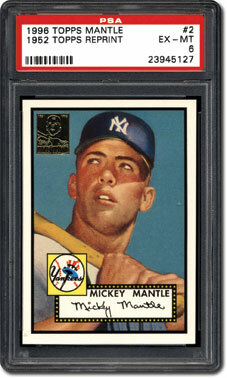 Thirty-six other special Mantle feature and combo cards were also reprinted in 1996, and each reprint is stamped with a gold foil insert from his iconic 1952 high number card. 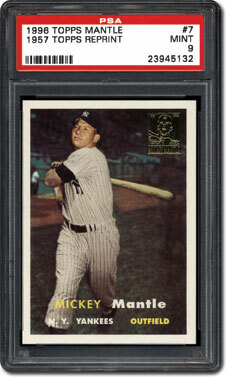 Mickey Mantle remains as popular today as he ever was - perhaps even more so. 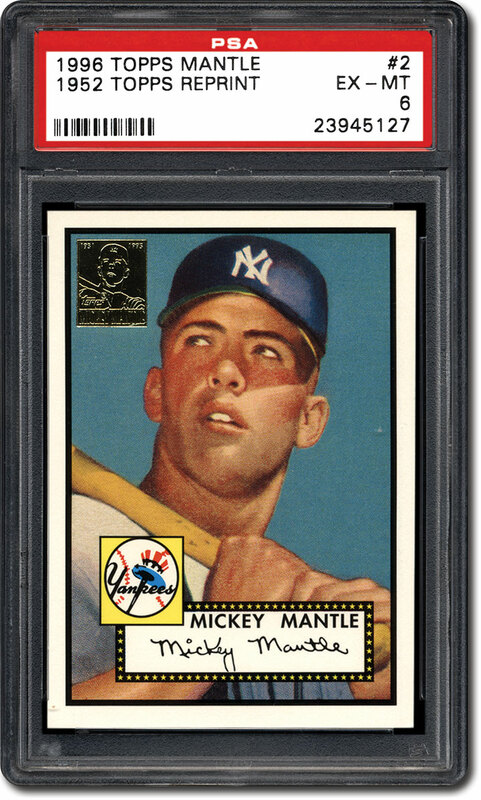 In recent months, his 1950s baseball cards have commanded amazing prices: In December of 2014, a PSA 8 example of his 1952 Topps card sold for $268,000! 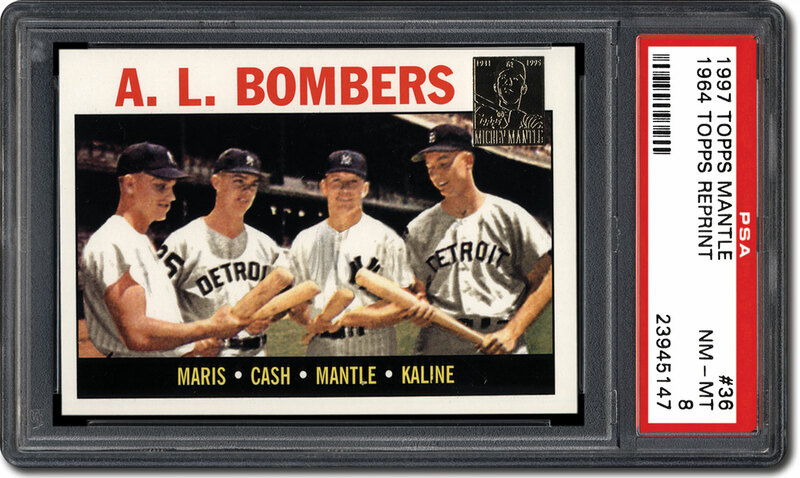 A 1953 Topps Mantle PSA 8 soared well past $20,000 at auction last November, while three different 1957 Topps Mantles in the same grade have hit the $5,000 mark over the last year. 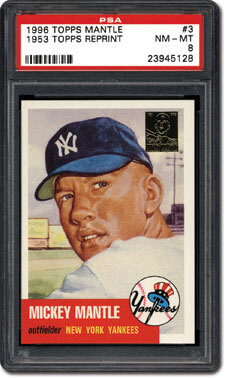 More obscure Mantle cards, such as his 1959 Bazooka edition, 1961-63 Post/Jell-O and 1968 Trans-O-Gram game cards, have also become sought-after collectibles. 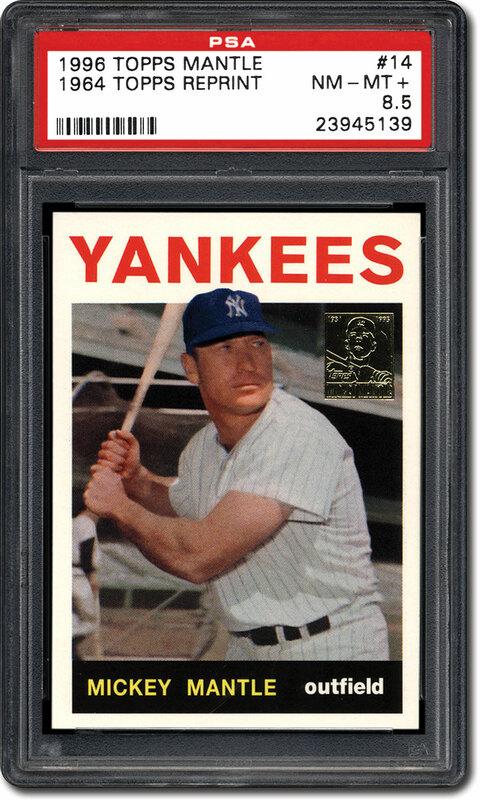 The same can be said about ticket stubs and programs from games in which he hit home runs, along with advertising items and endorsed products. Several years ago, I picked up a late-1961 vintage tabletop AM radio that was marketed to take advantage of the Mantle-Maris home run chase, and even those have become "hot" collectibles when you can actually find one that has all its parts and still works. There's no simple explanation for Mickey Mantle's enduring popularity. 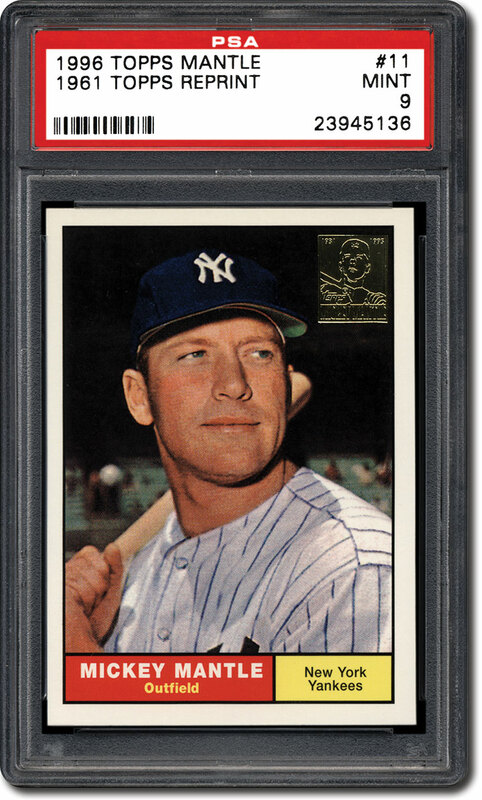 He was a genuine sports hero to Baby Boomers, a larger-than-life character from America's heartland who made the big time in New York and rode the popularity of television and baseball to immortality. You just can't make stuff up like that anymore. By the way, I finally bought that autographed Mantle ball, and it still sits prominently on a shelf in my office to this day. 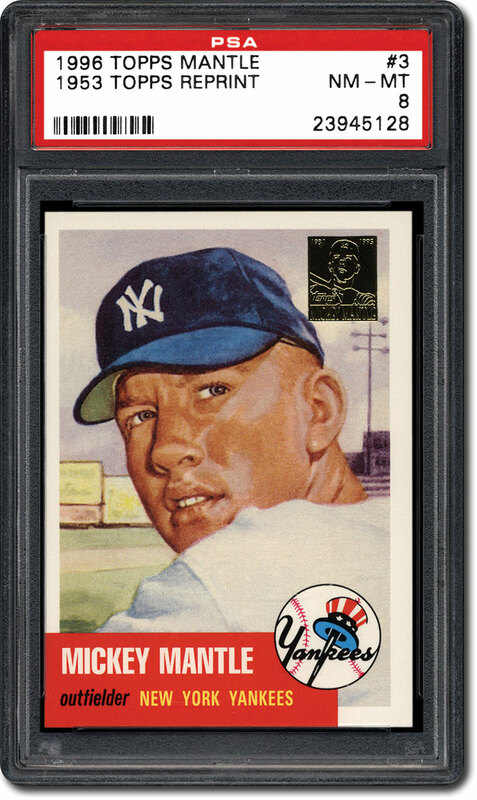 SMR would like to thank Pete Putman for providing the cards to go along with this article and for scanning the various magazine covers from his personal collection to feature in this piece.